Some people’s idea of packing light is simply tossing a cell phone, toothbrush, and clean underwear into a briefcase and heading for the airport. I’m not that spartan. I like to arrive at my destination looking my best. Airport security restrictions concerning gels and liquids in my carryon have made that goal more challenging. But one solution is to use cosmetics that come in solid form. For instance, pencil concealers, lip-liners, eyeliners, and brow colorants don’t need to be in your quart-size liquids bag. And if you pack pencils that have already been whittled down to at least half of their original length, you save even more room. To achieve that “half size,” I use new pencils at home, and when each one has dwindled to the right size, I transfer it to my travel bag and open a new pencil for home use. That also ensures having a tried-and-true brand and color with me on trips. I learned that lesson after unwittingly packing an unsuitable pencil once and not having a chance to shop for a replacement. Pencils do require sharpeners, but a lightweight plastic model doesn’t take up much room. In a pinch, a smudge of brow pencil or eyeliner can be blended on the eyelid for shadow. Ditto for lip-liner on cheeks as a rouge stand-in. And if you lightly sketch the surface of your lips with lip-liner topped with a thin layer of petroleum jelly, you’ll wind up with colored lip gloss. Lt. Columbo: They were written with a black eyebrow pencil. I spotted it right away because that’s what my wife always uses when she makes out her grocery list. When she goes into her purse, that’s the only kind of pencil she can ever find. Viveca Scott: Then you’re wasting your time here, aren’t you Lieutenant? Lt. Columbo: What do you mean? Viveca Scott: You’re talking to a redhead. Brunettes use black eyebrow pencil. Columbo drops his line of questioning . . . for the moment. But later he comments to Viveca about her appearance in publicity photos. Lt. Columbo: You always wear a beauty mark. Only, this morning you don’t have it on. Viveca Scott: Oh, is that all? It’s just one of those things I never do before lunch time, Darling. Bye-bye. Lt. Columbo: No. What I was wondering about was, uh, how do you put those things on? I mean, do you stick ’em on or do you paint ’em on or, uh…? She says nothing and simply stares at him. No doubt you’ve already guessed that Viveca Scott turns out to be the murderer. 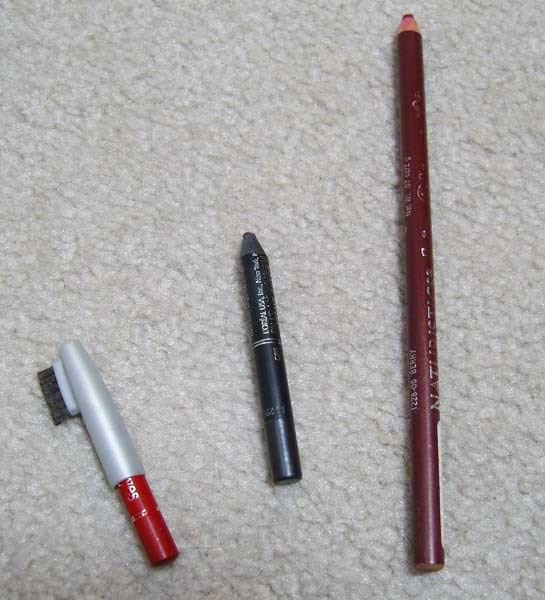 While your makeup selection usually won’t involve police lieutenants in rumpled raincoats, solid cosmetic pencils can at least cause airport security officers to view you with less suspicion. This entry was posted in Pennywise Packing Pointers and tagged carryon, Columbo, cosmetics, creative solutions, flying, mystery, packing, pencil, pencils, quart-size, saving room, security. Bookmark the permalink.